The European Telecommunications Standards Institute (ETSI) is an independent standardization group that develops standards for information and communications technologies (ICT) in Europe. Network functions virtualization (NFV) focuses on addressing problems involved in using proprietary hardware devices. With NFV, the necessity to install network-specific equipment is reduced, depending upon the use case requirements and economic benefits. The ETSI Industry Specification Group for Network Functions Virtualization (ETSI ISG NFV) sets the requirements, reference architecture, and the infrastructure specifications necessary to ensure virtualized functions are supported. Red Hat is offering an open-source based cloud-optimized solution to help the Communication Service Providers (CSP) to achieve IT and network convergence. Red Hat adds NFV features such as SR-IOV and DPDK-OVS to Red Hat OpenStack. Virtualized Network Functions (VNFs) - the software implementation of network functions, such as routers, firewalls, load balancers, broadband gateways, mobile packet processors, servicing nodes, signalling, location services, and so on. NFV Infrastructure (NFVi) - the physical resources (compute, storage, network) and the virtualization layer that make up the infrastructure. The network includes the datapath for forwarding packets between virtual machines and across hosts. This allows you to install VNFs without being concerned about the details of the underlying hardware. NFVi forms the foundation of the NFV stack. NFVi supports multi-tenancy and is managed by the Virtual Infrastructure Manager (VIM). Enhanced Platform Awareness (EPA) allows Red Hat Openstack Platform improve the virtual machine packet forwarding performance (throughput, latency, jitter) by exposing low-level CPU and NIC acceleration components to the VNF. NFV Management and Orchestration (MANO) - the management and orchestration layer focuses on all the service management tasks required throughout the lifecycle of the VNF. The main goals of MANO is to allow service definition, automation, error-correlation, monitoring and lifecycle of the network functions offered by the operator to its customers, decoupled from the physical infrastructure. This decoupling requires additional layer of management, provided by the Virtual Network Function Manager (VNFM). VNFM manages the lifecycle of the virtual machines and VNFs by either interacting directly with them or through the Element Management System (EMS) provided by the VNF vendor. The other important component defined by MANO is the Orchestrator also known as NFVO. NFVO interfaces with various databases and systems including Operations/Business Support Systems (OSS/BSS) on the top and with the VNFM on the bottom. If the NFVO wants to create a new service for a customer, it asks the VNFM to trigger the instantiation of a VNF (which may result in multiple virtual machines). Operations and Business Support Systems (OSS/BSS) - provides the essential business function applications, for example, operations support and billing. The OSS/BSS needs to be adapted to NFV, integrating with both legacy systems and the new MANO components. The BSS systems set policies based on service subscriptions and manage reporting and billing. Systems Administration, Automation and Life-Cycle Management - manages system administration, automation of the infrastructure components and life-cycle of the NFVI platform. 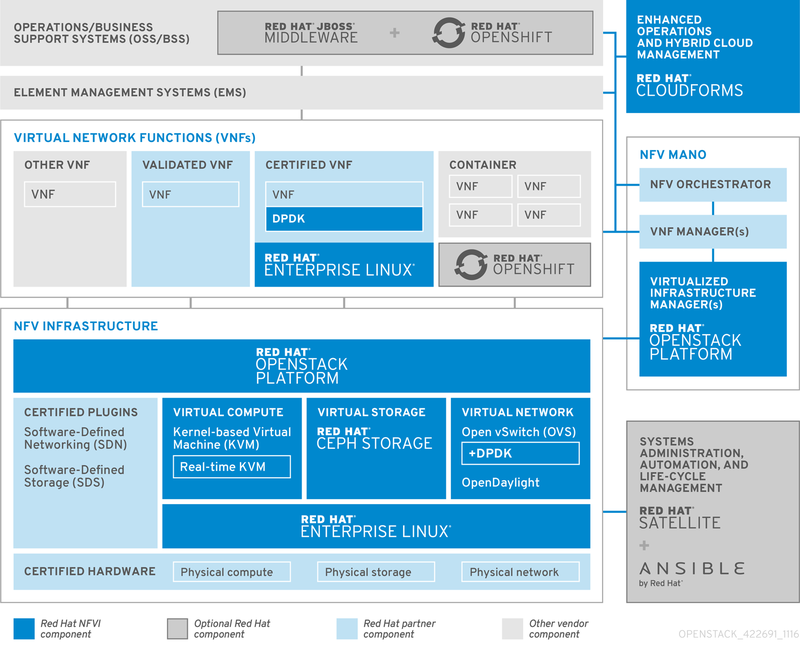 Red Hat OpenStack Platform - Supports IT and NFV workloads. The Enhanced Platform Awareness (EPA) features deliver deterministic performance improvements through CPU Pinning, Huge pages, Non-Uniform Memory Access (NUMA) affinity and network adaptors (NICs) supporting SR-IOV and OVS-DPDK. Red Hat Enterprise Linux and Red Hat Enterprise Linux Atomic Host - Create virtual machines and containers as VNFs. Red Hat Ceph Storage - Provides the the unified elastic and high-performance storage layer for all the needs of the service provider workloads. Red Hat JBoss Middleware and OpenShift Enterprise by Red Hat - Optionally provide the ability to modernize the OSS/BSS components. Red Hat CloudForms - Provides a VNF manager and presents data from multiple sources, such as the VIM and the NFVi in a unified display. Red Hat Satellite and Ansible by Red Hat - Optinally provide enhanced systems administration, automation and life-cycle label anagement. The Red Hat OpenStack Platform directo rinstalls and manages a complete OpenStack environment. The director is based on the upstream OpenStack TripleO project, which is an abbreviation for "OpenStack-On-OpenStack". This project takes advantage of the OpenStack components to install a fully operational OpenStack environment; this includes a minimal OpenStack node called the undercloud. The undercloud provisions and controls the overcloud (a series of bare metal systems used as the production OpenStack nodes). The director provides a simple method for installing a complete Red Hat OpenStack Platform environment that is both lean and robust. For more information on installing the undercloud and overcloud, see Red Hat OpenStack Platform Director Installation and Usage. Include SR-IOV, and PCI Passthrough parameters to your network-environment.yaml file, update the first-boot.yaml file to set the Compute kernel arguments, modify the compute.yaml file and run the overcloud_deply.sh script to deploy the overcloud. Install the DPDK libraries and drivers for fast packets processing by polling data directly from the NICs. Include the DPDK parameters to your network-environment.yaml file, update the first-boot.yaml files to set Compute kernel arguments, update the compute.yaml file to set the bridge with DPDK port, update the controller.yaml file to set the bridge and an interface with VLAN configured and run the overcloud_deploy.sh script to deploy the overcloud. For detailed information on the configuration procedure steps, see Network Function Virtualization Configuration Guide.